Signs of milk fever in sheep and treatment using antacids. Supplies needed in our second year of lambing and things you may want to consider. About one year ago we entered the world of becoming a shepherd/shepherdess. We dove into it head on with a flock of 15 registered purebred Romeldale and Romney sheep of varying ages, genetics and fleece color / types. We knew going in that this was not a quick lucrative position. I should also mention the critical point which was we had never been raised on a farm nor had livestock (unless you count our two children). So, for those who have stumbled upon our blog who are thinking of getting sheep and never had live stock before here are some things to consider to prepare for your first flock. Mind you again we dove in 15 strong which compounded our needs and information below. This isn't a how to raise sheep as it is how to prepare a human and their farm for their first flock if your starting with nothing. Unless your going to pay year round for hay and grain, your going to need some land with some grass. The best introductory book I have read so far is All Flesh is Grass. In Iowa we can get by with 5 sheep to 1 acre of land as long as it rains enough. Drought years can get tight. Google your area for your livestock ratio, typically one of your local universities or online forums will give you a good gauge. Couple of things to keep in mind about grass; you want variety, you dont graze below four inches, and don't let the grass go to seed (mow your pasture after you have grazed it and before it turns to seed). You also want to look up poisionouse sheep plants for your area, unlikely your sheep will eat enough to kill themselves but has been known to happen if that all they have to eat. If one of your incomes will be wool, hunt out all the thistle -- and you might as well use an herbicide (unless you have tons of time to dig) if you have a lot of it. Ok this looks easy on the surface but if you're getting sheep and depending on the activity of your farm / family here is my opinion and reasons why. Mind you I have installed every singel type of fence listed below. Go with Red Brand fence if it is available in your area, and get the heavy gauge 12.5g if you plan to be there for a long time. It will hold up better over time. Benefits include not having to trim the weeds every week, livestock cant charge through, don't need to worry about young children running around outside. Down side: if the fence holes are to big (4"x4") then an animal has a chance to hang itself or get its head through. Fortunatly they sell sheep and goat fence with smaller openings. Chances of this happening are very unlikely but it is possible. At the top of the fence you can install an electrical or barb wire line just in case you have a climber. cost wise its a bit more than smooth wire high tinsel but worth the extra money not to have to trim and deal with electrical problems every weekend. We installed this because it came so highly recommended. As I installed the last staple my neighbor drove by and said -- "you will regret putting that in, bet you will go to woven wire". well one year later and I am wishing we had put in woven wire. The benefit of woven wire is that its easy to install, and cheaper to put in. if you go with a 8-9 wire stranded fence it will keep in sheep (we haven't had one escape yet). The downside: electrical is a pain especially in the spring, summer, fall. Every week we have to trim the fence line which takes a lot of time....again every week. Second, we had an incident with our youngest child and the high-tensile electric fence who was three at the time. He wanted to follow his older brother into one of the empty padlock areas. At the time we strung up temporary poly wire rope to divide the pastures. He decided to try and crawl under the fence like his brother and was shocked. we have a brand name shocker so it is intermittent but being shocked to the head took him down and put him into a full seizure. Ambulance, and air care the whole bit was on its way. Luckily he came out as the ambulance arrived and air care wasn't needed. Had he gotten caught between the wires and hung there and if his brother wasn't there to pull him away from the fence this could have been a different story. We have begun converting our farm from high-tensile to woven wire or to welded wire panels. Never used barb wire but would say its good for cattle and large livestock only. Welded wire panels are often referred to as Cattle panels. Cattle Panels come in 16'x50' sections. This is similar to woven wire but the gauge of wire is 4 gauge (much bigger) and can be installed with T-Post placed ever 6 feet or so. Again. hanging sheep are an issue as most have 4x4 holes. This fencing is comparable to woven wire. The upside is that it can be moved to reconfigure padlocks or areas. If your leasing land or don't think your in your forever home it can be taken down and placed at the next farm. It can be considered as a permanent and temporary fence. The biggest downside is that it is expensive if your buying it new. Total cost for T-Post and panels $2 /sq ft.
Woven wire panels can also be used as coral pens. You will want to make your pen tight so you can crowd the sheep into it. This keeps them from being able to run, which means they can jump over the fence and limits how much you need to run / work. Unless you want to pay the vet every-time a sheep gets sick, start taking notes from messaging boards and facebook. You will need to learn how to draw up shots, give shots, drench a sheep for de-worming, and trim hooves. Find a local livestock vet that knows sheep - put them on your cell speed dial. Call your local livestock vet and start seeing what they can educate you on. Not all vets are knowledgeable in sheep -- this will depend on your area. You may end up being your sheeps advocate. Sheerer - if your sheep are a wool breed start getting recommendations for a good sheerer -- they are hard to come by. Guard llama - if you have any predators then a guard llama is a sure bet in protection. Some use donkeys and dogs which all do very well too. We proffer the llama because they eat and are treated the same as the sheep. Water buckets 16 gallons / smaller for lambs. 1 bucket per 20 sheep. Use plastic the metal tanks will cause issues with your fleece. Hoof Trimmers - learn how to trim hooves, find a really sharp pair, you're going to need someone to show you how to do this the first time. Grain buckets - train them to know what the bucket is so they will follow you rather than you chasing them. Sheep are food motivated. They also love graham crackers -- stock up. Straw supplier (local farmer) - don't buy from a retail store they will charge you double what you can get from a local farmer. We use combined oat straw because it doesn't get into the wool and absorbs better. Whole Corn and Grain (local farmer) - be careful with feeding grain, read up on this. Bulk feed bin - mice will get into your paper feed bags and your grain can mold quickly if left in bags. Buy 50 gal food grade plastic drums with clamp on tops or 32 gal trash bins with tops. this will keep mice and other critters out of your feed. Ear Tags - sign up for your local scrapie program, you will need a tag applicator too. If your raising wool sheep, I would recommend sheep coats to protect the wool and keep it clean. If your lambing you're going to need heat lamps, panels, creep feeder gate, towels, long sleeved gloves, gloves, antiseptic gel lubricant, navel clamps. If this is your first time and your thinking about or just bought sheep and need help; give us a call. If you raise sheep and know of other things you needed your first year, please comment below. Two of the girls we purchased from Peeper Hollow Farms in 2016 placed first in their divisions for White Hand Spinning and Natural Color Hand Spinning. One of the girls we purchased in 2016 from Grace Valley Farms (now a retired flock) took Second in her division Natural color long wool. The small things that remind us the reality of the choices, friends, knowledge, experiences that has flooded us in the last year. Diagnosis: Meningeal Worm, M-Worm. Sheep Symptoms: eyes rolling or moving back and forth rapidly (nystagmus), appears drunk, trouble walking, head swaying or rocking back and forth rapidly. Petal about 6 months after Meningeal worm diagnosis. Pregnant with one lamb. Your summer garden doesn't have to just be vegetables. Plant an assortment of picking flowers that can be used for in the house or to give to friends. this year we did Benary's Giant Zinnias and sunflowers which are doing very well and have given us a ton of flowers this summer. Perhaps next year we will explore a couple other species. Flowers help attract pollinators to the garden and also add a lot of color. Zinnias are a favorite because they are hardy and bloom all summer long. An assorted color pack gives you a wide variety to choose from the whole summer. 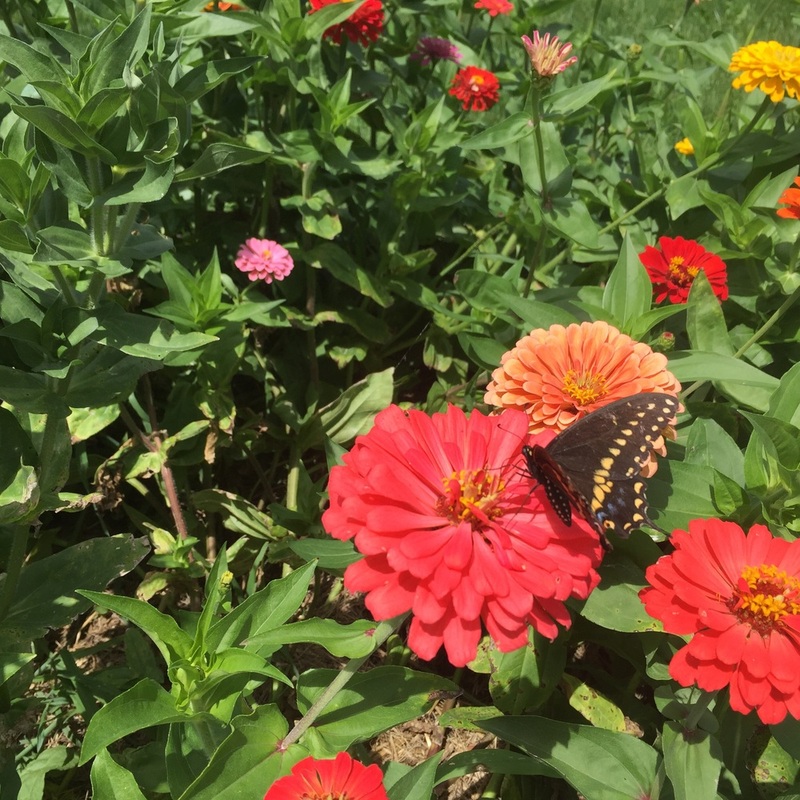 One of my favorite companies to buy our garden seeds from is Seedsavers.org - here's a link to their Benary's Giant Zinnia. The kids also enjoy planting the flowers because they can pick them all summer long for mom. Aunt Cati sent Bentley a package of sunflowers for his fifth birthday. This year. The kids both enjoyed planting them in the spring (big fat seeds are easy for kids to see and plant) and are now figuring out what these huge plants are ....Sunflowers!!!! The surprise .... Just a pose he randomly gives. The sight of the first sunflowers brought back one of my forgotten memories of being in Germany. I was located out in the country side and would walk 2-3 miles to town on the weekends to grab a train. On the side of the road one of the farmers planted a stock of flowers that you could self pick With a box on the side for donations (At least that's what I translated the sign to say per my German translation dictionary). I would stop in every weekend to pick a couple flowers for where I was staying and give a small donation of what I could afford. This is a great memory and brilliant idea. Perhaps one for the future of our Farm. Holy buckets this was a long project and I still have a bit more to finish up. The experience was well worth it! And a big thank you to all of our parents who helped with installation or watching the kiddos. We started planning our fence last December and thankfully with an early spring we were able to get this fence done on time for our sheep and lama in June (next weekend!!!). Pounded posts in the ground at the end of March. Assemnled brace posts and brace wire in April-May. Installed eight strand of high-tensil wire in May. Eight wires three that are hot. Tried to think of everything but I am sure the sheep will prove me wrong and somehow I am sure the sheep will still find a way out. We had the very fortunate opportunity to meet our future guardian llama "Moose" this past Saurday. Thank you to Nick Hauptly at Nameste Farm in Alburnett Iowa for introducing us to the world of llamas, sharing your wealth of knowledge and love for this breed with us and our children. Kids getting kisses from a young curious llama. Moose is in the back ground keeping watch. We seeded about 12 acres with a drill today. A very large thank you to our dear friends for letting us lease the land and equipment to establish our dream. This effort in planting pasture is more about securing the future for planned growth. For the first two years it will be used for hay and light rotational grazing. This morning we got our second batch of chickens in. This time 16 Black Stars, 15 Rhode Island Reds, 16 Araucanas and one exotic odd ball. That's right 48 more added to the insanity. Hopefully most are hens and will be producing some fantastic pasture raised crackle berries (eggs) in 15 weeks. Let us know if you are interested in a monthly supply (must live near us to pick up, will deliver for a group of people) by sending your email address through our LocalHarvest Store. 4 A.M. And the phone rings, it's the post office. "Mr. Brodeur your chicks are here in our post office. Would you like to pick them up?" i jumped out of bed as this has been the anticipated call for the last four weeks as I worked in below freezing temperatures to get an old corn crib required and safe for the acceptance of such fragil little things. Two days prior we had laid down the country boy pine shavings and setup the brooder leaving the lights on and checking the temperature to make sure it was staying in the 90 degree range. We also placed hay around the bordering barn walls to help prevent drafts. Ohio Brooder, straw around border to prevent drafts, Country Boy pine shavings. Out to the corn crib in the dark cold morning I ran with some self made electrolyte water and scooped some fermented chick starter out of the bucket and into a feeder tray. I also placed a bit of newspaper with some feed on it as well. Temperatures had dipped back to the 20 degrees mark with howling winds and we had freezing rain coming through. Jumped in the truck, started it up and got ready to leave then realized I could not see out the window. Sheet of ice, great. Hopped out scraped out a peep hole and took off down the gravel road. I arrived at the post office and the workers couldn't have been nicer. I think the chicks brought some joy to the mail room. Picked up the chicks and ran out to the truck and on our way back home we went. Red Red Ranger chicks and one odd ball. We arrived back to the corn crib and did everything I had read. Checked each chicks rear end for pasty but, dipped each ones into the electrolyte water and set them near the heat lamp. Checked them a couple times and noticed they were all huddled on one end of the brooder under the 250w lamp. So I swapped out the other lamp which had a 125w lamp and loaded a 250w. then was off to work. During the day Emilly was home with the boys and had a blast holding their first chicks. Kids first chicks at home very excited. By time I returned from work around five the chicks ate all of the fermented feed and pretty much left the dry stuff alone. I gave them another feeder full of fermented feed and closed them up for the night. First time raising RedRanger broilers. Setup our cor crib to hold broilers and hens. Chickens, Chickens, Chickens. Brodeur Family Farms will be raising free rang chicken for meat and eggs. We will be getting our first batch of chicks at the end of February. 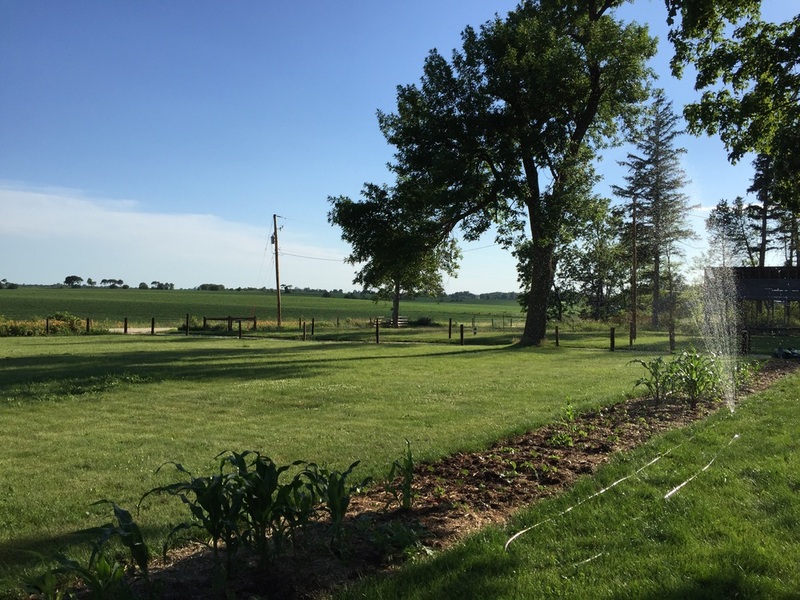 I greatly underestimated two critical elements in my undertaking of a new "organic" garden on fresh prairie meadow, the power of mother nature and time it takes to overtake her powers. I burned it, I tilled it, and broke sweat and tears on it; and it all came back -- again and again and again it would not stop. Since I have bills and must work a full time job I could not afford to spend hours each day or eight hours each weekend weeding the protest of weeds. During this time I also came to realize the efforts of the new founding settlers must have gone through to clear and maintain thee crops. It is truly brutal work. It is no wounded to me know why farms become organic and do not originate organic unless you have no other life. If you are going to break new ground use an herbicide, plant a resistant crop and maintain this process for at least one year or two. Then begin the process. Obviously there are other methods but this is my opinion of the easiest way to start. 2015 Lesson learned grow what you enjoy. 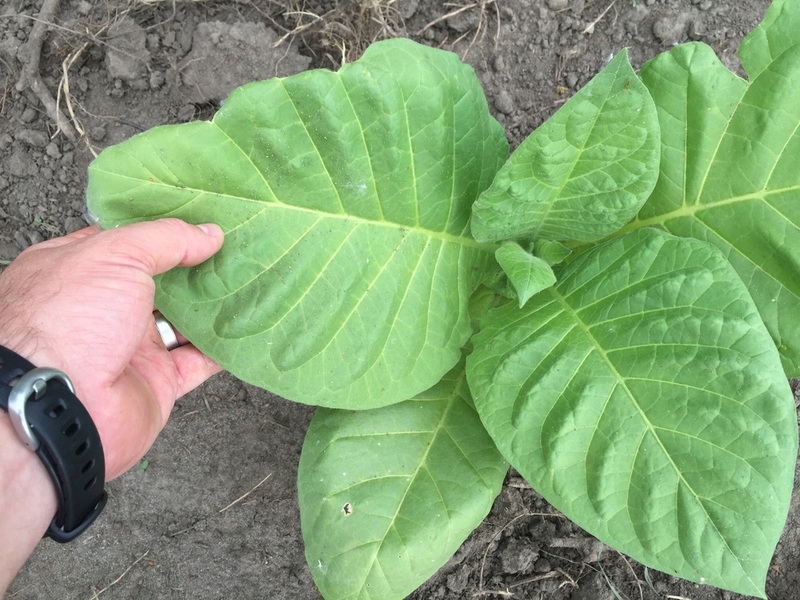 Tobacco test, grows great but did not dry in the open Iowa barn conditions. Needs a drying environment that is more controlled. Harvesting the tobacco was labor intensive and although fun to grow however, their was no benefit as we do not smoke. Hand weeded and planted 2016 whole leaf tobacco.